Last Thursday, the 15th of January, I went to see how decisions relating to Cambridge’s River Cam are made at a meeting of the Cam Conservators, which was held in the fantastically opulent setting of the old hall at Queens’ College. One of the main items the Conservators discussed was regulating punting in the forthcoming summer. James Bayliss-Smith, an independent punter, warned them that given the loss of Jesus Green and the restricted capacity at the La-Mimosa platform there would be many independents trying to operate from the remaining public access points. If the number of independents remained un-capped he predicted that maybe fifty or so independent operators would be trying to work out of Garrett Hostel Lane at the peak of the season. Mr Bayliss-Smith suggested that Jesus Green was a suitable place for a number of people to operate punt tours from whereas Garrett Hostel Lane is not. Clearly there is good money in punting, and it was suggested that each year those who are successful come back with even more boats, and attract new people to work on the river, some of whom learn the ropes one year and come back running their own operation the next. Mr Bayliss-Smith asked if and when the expansion would be checked saying: “if all the operators double or triple their fleets – at some point we have to say enough is enough, we can’t have an increase every year”. Some conservators asked if there would be any self-limiting effect, independent punters suggested there wouldn’t be as more punts would be combined with more marketing, both on the streets and online, Kings Parade could become flooded with touts they warned. While it is a counterintuitive position at first glance – what the meeting saw was independent punters being the ones clamoring for more regulation of their own business. We have a body of highly responsible, sensible and community minded independent punters in Cambridge. As well as adding life to the river they provide crucial competition. I think we have to ensure that any enforcement and regulation of punting does not make business too difficult for this group. Someone appointed by Cambridgeshire County Council. Cambridge City Council has appointed two Liberal Democrats, Cllrs Ward and Nimmo-Smith along with Labour Councillor Lucy Walker. The council’s other four positions are filled by individuals including Luther Phillips, who often represents the camboaters and Mr R Ingersent of Scudamores. Conservators are joined at their meetings by a number of observers who get to participate fully in the meetings and get papers sent to them in advance (While agendas and minutes are published, meeting papers are not made publicly available online, and the Cam Conservators are not subject to the Freedom of Information Act). The most active observer was James Bayliss-Smith, an independent punter, another significantly contributing observer was Bill Key, President of the Cambridgeshire Rowing Association. Meetings of the conservators are held in public, and eight members of the public, in addition to the formal observers, watched proceedings on the 15th. The Conservators are the statutory navigation authority for the River Cam between The Mill Pond, Silver Street, Cambridge to Bottisham Lock with lesser responsibilities up-stream to Byron’s Pool. Neither Cllr Nimmo-Smith or Cllr Ward attended the meeting I observed, this meant the ruling group on the city council was totally unrepresented. Cllr Nimmo-Smith was present in the room before the meeting started but left to attend another meeting before it got underway. The city council’s newly appointed punting officer did not attend to observe, in fact no city council officers were present. The Conservators briefly discussed the Jesus Green lottery bid, noting that the Jesus Lock, and the Lock Keepers cottage had originally been excluded from the proposals, but were now included. A conservator asked: “does this mean we’re now partners in the bid?”, the chair responded that he thought that “partners” was a bit strong. As the owners of the Lock Keeper’s cottage which is involved in the plans I would have thought they would have been kept well informed by the council, but the Chair of the Conservators told the meeting; “we haven’t seen the final bid document“. I have been calling for the document to be made available on the City Council’s website, clearly there is a need for the council to be more open. I wonder what proposals for Jesus Lock they were referring to I have not seen any mention of works to the lock itsself, the proposed bridge has been withdrawn but the hydroelectric plant proposed for the weir remains. James Bayliss-Smith, the observer, and an independent punt operator asked if the Conservators had the power to refuse to license punt operators who they were aware were operating in an unsafe manner. The chair replied : “I don’t believe we do”. He said that the Conservators could, and did, prosecute those who breach the by-laws but could not refuse to issue a licence. The chair suggested that the Conservators could ask the City Council for the power to refuse punt operators licences. As a way of getting round this problem a suggestion was made that different categories of license could be brought in, with people being eligible for a cheaper licence if they could demonstrate higher safety standards, perhaps by having taken a course and obtaining an (unspecified) safety certificate. The chair explained the license was for the craft, not the owner, so if there was nothing wrong with the craft then they would have no case for refusing a licence. James Bayliss-Smith asked if it would take an Act of Parliament to change the statutes to enable the Conservators to refuse to license individuals. The chairman of the conservators said yes that, or a ministerial order would be required. However the chair said conservators were in discussions with the council about the various options available. James Bayliss-Smith suggested that Cambridge could learn from the experience of Venice, where he said the number of Gondolas was regulated. He warned that causal opportunists might be drawn to the river and there might be a snowball effect in terms of numbers of punters. James Bayliss-Smith asked if there was anyway the conservators could refuse licenses for prospective independent punters on the grounds that they will inevitably, if they’re mostly operating out of Garrett Hostel lane, cause a navigational hazard. He said that he didn’t think it would be possible to decrease the numbers simply by increasing the charges saying “even doubling the licensing fees would make no difference”. The committee decided to leave the “multiplier” – of the standard punt rates which apply to independents unchanged, they decided not to use their ability to vary registration fees as a mechanism to regulate. A suggestion by conservators that independent punters all earnt thousands was refuted by independent punters observing the meeting. 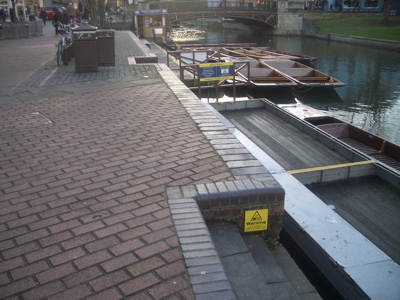 It was reported that there was to be a meeting between Cambridge City Council and the Conservators on Friday the 16th of January to discuss options for capping / licensing / enforcement of punting and that this meeting was not to be held in public. The members of the public who were also independent punt operators heckled the chair and asked its minutes would be published. The chair replied: “Its a council meeting, so I would have thought so”. Clearly though if it was truly a council meeting it ought to have been held in public. The Conservators had been sent a letter by King’s college complaining about punters operating below their bridge, and picking up punters from their college grounds. MR Bayliss-Smith responded to say that attracting business while on one’s boat is the most traditional form of punt touting and ought be encouraged. He suggested the issue at King’s was not a new one, and the college were probably just aware of the fact the situation was being looked at so decided to write now. The Conservators discussed if they ought spread their £600K investments, which are currently with only two different institutions, more widely. They decided to form a sub-group and take professional advice. Some members wanted them to look at property as long term investment. The Conservators also, for the first time, considered a capital plan, which was welcomed. There was a proposal to increase all charges by the same percentage amount. A representative of the rowers pointed out that at £50 for an eight the registration fee on the Cam was much more than in Environment Agency areas, where it was just £8. Imposing the EA’s percentage increase on the Conservator’s figure was increasing that differential. The rowing representative said rowers questioned the need for the degree of wages on staff given they were dealing with such a small piece of river. The question of balance of income between powered and unpowered craft was raised, the chair pointed out there was a risk that if the conservators fees rose, then those boats would register elsewhere and their revenue would be lost entirely. For motor powered vessels the Cam Conservators charge 95% of the Environment Agency fee. The chair warned the conservators against making drastic changes to the make up of the registration fees without proper consideration of all the difficult to predict knock on effects. There was a general understanding of the situation being that unpowered craft were subsidising the powered craft. Both the rowers and independent punters clearly thought this was unfair. Deputy chairman, and university representative Dr Walker spoke saying he cautioned against the concept of fairness, he said that the Conservators were a mechanism through which the City of Cambridge benefits from the tourist industry – justifying the current registration fee arrangements. The cost of rowing in Cambridge was discussed, one member drew a comparison between the registration fee for a rowing boat with the cost of a round of golf. Non rowing representatives said that membership fees for the Cambridge rowing clubs were relatively cheap especially when compared with clubs on the Tideway in London where they need to pay London rates. In this context the current charges for the registration of rowing boats on the Cam were justified. The rowing representative took the opportunity to say that rowing was much more inclusive than golf, and that despite its image he said that rowing was not elitist. A representative of the Eastern Region Rowing Association asked why the conservators didn’t seek more external funding, on the basis of the recreational facility which the river provides. He suggested that more funding ought be sought from those living on the river, and from the City Council – on the basis everyone in the City benefits from the river. The Conservators agreed dates for river lowering in 2009, the idea is that a pre-announced two week lowering will allow all those who want to do maintenance or inspection work can get it done in that time. Those wanting to do work wanted the river and the ground not to be frozen and other river users wanted to avoid the summer. Conservators asked independent punters if it was important to avoid Valentines day and were told by one individual that it being Valentines day could make the difference between making £3 on a trip and making £60. November the 16th – 29th 2009 was decided upon, with two weeks from Monday the 1st of February 2010 set as an alternative if the river was in flood during the November period. An actuator is to replace the gearbox on the guillotine gate at Baits Bite Lock. The need for this had been identified in a safety audit, the dramatic concern which was put to the committee was that without this repair that the gate could crash down possibly chopping a boat in half. Conservators considered the possibility of approaching the Environment Agency for a contribution for the work as the gate can be used as a sluice in extreme floods, when the other lock gate is kept open and a flow of water allowed under the guillotine gate and through the lock. Conservators decided to approve spending of £400 X 3 for three staff to receive training in the use of pesticides, which will be used to tackle floating pennywort where it is growing on the banks and among vegetation on the banks. Conservators asked if the pesticide to be used is specific, and were told by the river manager that it was. James Bayliss-Smith, who had seen the papers so knew the proposed pesticide was RoundUp was able to counter this claim, he pointed out that it is broad spectrum pesticide and was worried it could be toxic to humans. He asked for an assurance that it would not be used on the middle river, where punters would get it on their hands. He was assured it would only be used on the lower river, and the river bailiff said that he anticipated being quite careful and directional with its application. The Conservators approved the installation of a memorial bench, conditional on it being in an appropriate style, under the same terms as previous benches. The chair reported that he wanted to see the work of the conservators recognised in this way, perhaps hoping for more public money. The river manager reported that there had been a court hearing on the Tuesday before the meeting at which four cases of breaches of the bye-laws had been heard, three more were due in a week’s time and a second batch due in February. These related to unpaid registrations and lack of boat safety certificates, it was reported that these cleared up all the enforcement actions relating to registrations for the current (April-April) year. James Bayliss-Smith took the opportunity to complain that Cambridge City Council were disgraceful in terms of their consultations with independent punters. A list of upcomming events was presented to the meeting, including a Duck Race on Quayside in February, and the mooring of the Georgina for use as a floating casino at Magdalene College for a May Ball later in the year. I have written a number of other posts in which I have referred to the Conservators of the Cam. This entry was tagged Cambridge, Punting on January 20, 2009 by Richard Taylor. Many thanks for your concise and detailed reports on all the Cambridge meetings you attend. The sort of stuff you would expect the CEN to do but sadly are totally incapable off. I read all your reports in Google Reader. Are you on Twitter so I can follow you there too? I have made a freedom of information request for details of the meeting between the Conservators and the Council on the subject of regulating punting. I used MySociety’s Whatdotheyknow.com website which will ensure any response is made publicly available. The Telegraph has run an article on the “Punt Wars” in which I am quoted. The article followed on from a Cambridge News article based on a Freedom of Information request they made to the police to ask them about punt wars related incidents. The police have posted their response to that FOI request online.